Devide provides no information on their website about who owns or runs the business. The Devide website domain (“devide.com”) was first registered in 2011. The domain registration was last updated in May, 2018. This is probably around the time the current owners took possession of it. Further research into Devide reveals a since-deleted “Word From Devide CEO”, dated June 10th. 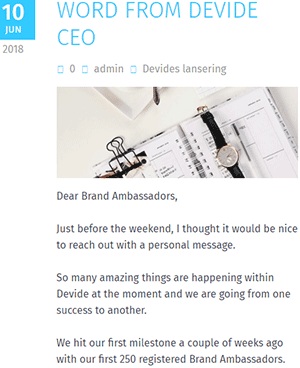 The email itself is just marketing spam but is signed off on by “Anja Al-Akabi” as “CEO Devide”. On her LinkedIn profile, Al-Akabi cites her location as Andalusia, Spain. Altogether Devide seems to be primarily marketed in and targeting Europe. In case you haven’t heard, we have two events coming up where we show you “Devide the Movie”; one in Oslo on the 16th of June and one in Gothenburg on the 17th of June. Whatever you do, don’t miss the chance of meeting some of our top Brand Ambassadors in those two cities. It is also supported by Devide’s use of euro in its compensation plan. Devide does provide a corporate address in Malta for “Vindorale LTD” on their website. The address provided actually belongs to Walter Rizzo & Associates, who on their website provide a Maltese Holding Company service. Thus is appears Vindorale LTD is just a shell company, and Devide has no actual physical business operations in Malta. According to Al-Akabi’s social media profiles, prior to Devide she was working as CEO of Loft & Roomers, a furniture store in Spain. Possibly due to language-barriers, I was unable to put together or verify Al-Akabi’s MLM history. Read on for a full review of the Devide MLM opportunity. Devide has no retailable products or services, with affiliates only able to market Devide affiliate membership itself. Devide affiliates invest in €1199 EUR “brand box” positions”. Each brand box positions comes with a set of profit points, which are marketed as having potential future value. In addition to acquiring profit points through brand box position investment, Devide affiliates can also directly invest in them. 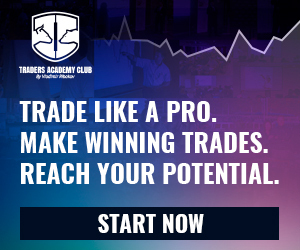 30% of all commissions paid out must also be reinvested back into Profit Points. Profit points exist only within Devide and hold no value outside of the company itself. To realize a ROI on profit point investment, Devide affiliates can exchange profit points for real money via an internal exchange. Devide claim their internal exchange is funded by 50% of company-wide investment volume. Note that Devide do not publish the current internal value of profit points. On the MLM side of things, Devide affiliates are paid on the direct and indirect recruitment of new affiliate investors. Devide rewards affiliates with a €50 EUR commission on the first three affiliates recruited. From the fourth, €100 EUR is paid per recruit. If a Devide affiliate recruits three affiliates within their first month, they also qualify for a €1200 EUR voucher. Devide pays residual recruitment commissions via a binary compensation structure. Residual recruitment commissions are calculated off of brand box investment. Investment in a brand box by a Devide affiliate generates 500 points on whichever side of the binary team that affiliate was placed. At the end of each week Devide tallies up new points on both sides of the binary team. Affiliates are paid €0.1 EUR per point of matched volume. 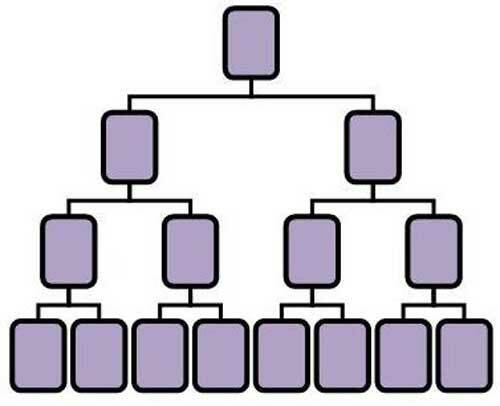 To qualify for residual recruitment commissions, a Devide affiliate must recruit at least two affiliates (one placed on either side of the binary team). If the affiliate recruits two affiliates on both sides of the binary team, their residual recruitment commission rate is doubled (€0.2 EUR paid out per matched point). Leftover volume on the stronger binary side is carried over but only retained for up to six months. Note that residual recruitment commissions are capped per affiliate at €75,000 EUR a week. Devide pay a Matching Bonus on residual commissions earned by personally recruited affiliates (level 1) and affiliates they recruit (level 2). Upon generating 2,000,000 points or more in accumulated volume across the binary team in a year (Jan-Dec), a Devide affiliate qualifies for the Lifetime Bonus. The Lifetime Bonus is made up of 10% of Devide’s company-wide investment volume. Note that at least 50% of required points need to be generated within a single month, the rest is accumulated point volume. Devide affiliate membership costs €1199 EUR. Additional investment in profit points is an option beyond an initial affiliate position. Devide cloaks a typical Ponzi points business model behind social media “influencer” culture. We think it is unfair that only people with broad networks, a large number of followers on social media and huge bloggers always get the opportunities to get lifestyle products for free or with a heavy discount just to promote the products in their channels. No matter the size of network or the number of followers on social media we think that you should have the same opportunity. Considering Devide affiliates invest in profit points and get paid to recruit others who do the same, the marketing pitch makes little sense. Any products or services attached to Devide’s primary investment vehicle are incidental. 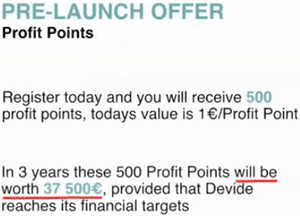 Devide’s profit points are just renamed Ponzi points. Affiliates invest in them and cash out via an internal exchange, which is funded by subsequent investment. There’s some malarkey about selling Saint Roches sunglasses and Haugher watches to customers, however you can visit the Devide website and verify yourself this doesn’t exist. As it stands Devide is operating as a Ponzi scheme, and has done so since it surfaced approximately three months ago. In addition to stealing from those who invest after you via the exchange, the only other way to recoup Devide losses is through recruitment. This makes Devide a hybrid Ponzi pyramid scheme. As with all MLM Ponzi schemes, once affiliate recruitment dies down so too will new investment. This will see the internal value of profit points plummet, coinciding with a collapse. On the backend real money is handed over to Anja Al-Akabi and other Devide executives, in exchange for worthless Ponzi points. Regardless of what happens to the internal value of profit points, Al-Akabi and the rest of Devide keep what they don’t pay out through the exchange. Other than a few early adopters, the math behind a Ponzi scheme guarantees the majority of Devide affiliates will lose money.